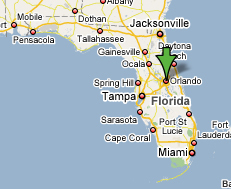 Orlando is the fifth largest city in the State of Florida and has a population of about 230 000. Originally the center of a major citrus-growing region, Orlando is now best known as the home of amusement attractions, including the Walt Disney World Resort, the Universal Orlando Resort, and SeaWorld. These destinations helped make Orlando the third most visited American city among travelers in 2007. 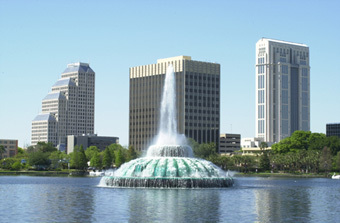 The Orlando Metropolitan Area is also home to a substantial theatre population; several professional and semi-professional houses and many community theaters are present in the area. For shopping, the Florida Mall is the largest mall in Orlando, one of the largest single-story malls in the USA at over 171,800 m2 with over 250 stores, seven department stores, and the Florida Mall Hotel & Conference Center Tower. Orlando is the home city of the Orlando Magic NBA team and is also famous for its athletics, lacrosse, bowls, ice-hockey, baseball and soccer teams. Discover Orlando, Florida and the surrounding country with Google Earth, a FREE satellite photo program for Windows which lets you zoom right in from a view of the whole planet, often to as close as a single house just with a simple click of a mouse. To install Google Earth on your PC, click here to download the program (about 13 Mb). Next, install the program on your PC and launch the application. To go directly to each location, simply click on the Google Earth logos below and choose "Open with Google Earth". You can also click on the "Google Maps" links to open Google Maps at the selected destination.